A development application has been submitted for the construction of an eight-storey mixed-use development located at 11 Cleveland Street, Greenslopes. The site currently contains a two storey commercial building and associated car parking. The site has frontages to Logan Road, Cleveland Street and Lincoln Street with vehicular access currently being provided via an existing crossover to Cleveland Street. 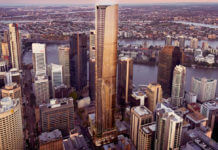 Designed by John Contoleon Architecture, the proposed eight-storey building will contain six levels of commercial office space, with the DA detailing possible health care services as a usage, as well as two levels of residential apartments. A total of x16 apartment dwelling are proposed in total, with 2x one bedroom units and 6x two bedroom units proposed on each floor. According to the development application, 190sqm of communal open space area is also proposed on the rooftop of the building, which would provide residents with additional access to natural light, sunlight and breeze to support outdoor subtropical living. 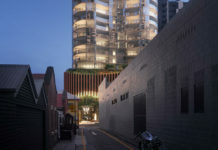 According to the development application, the provision of communal open space on the rooftop of the building will add visual interest to the building’s rooftop whilst providing for additional opportunities for passive surveillance of Cleveland Street, Lincoln Street and the adjacent Norman Creek/Hanlon Park and Bikeway. The development application number for this project is A004628795.